Going to the salon can be a bit messy. From getting your hair washed to the chemicals used in perms and highlights, you don’t want to have to sacrifice your clothing in order to the get the right style. That’s where shampoo capes come in! However, traditional capes aren’t very much fun. They may make your clients feel confident knowing that their clothing won’t be destroyed, but they aren’t much to look at. Don’t you want your clients to feel comfortable and stylish the entire time they’re in your salon? At Ladybird Line, we think so! Although we have plain black styles that will enhance any salon experience, we like to have a little fun with our garments. Even if they’re only being used to wash your clients’ hair! One way we have a little more fun with our garments is by making them in a wide variety of colors and patterns. If black isn’t really your color, choose from capes that are olive green, orange, and yellow. 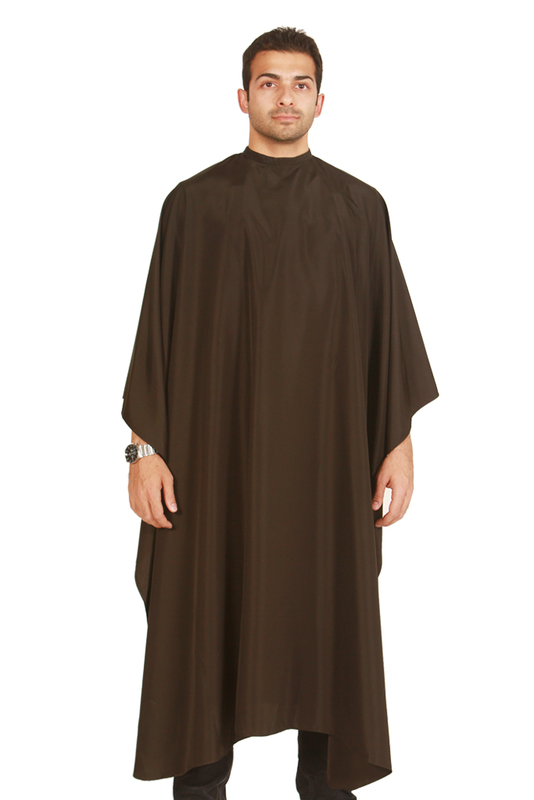 We even have a metallic cape with an eye-catching sheen. Some of our favorite garments here at Ladybird Line contain fun patterns. 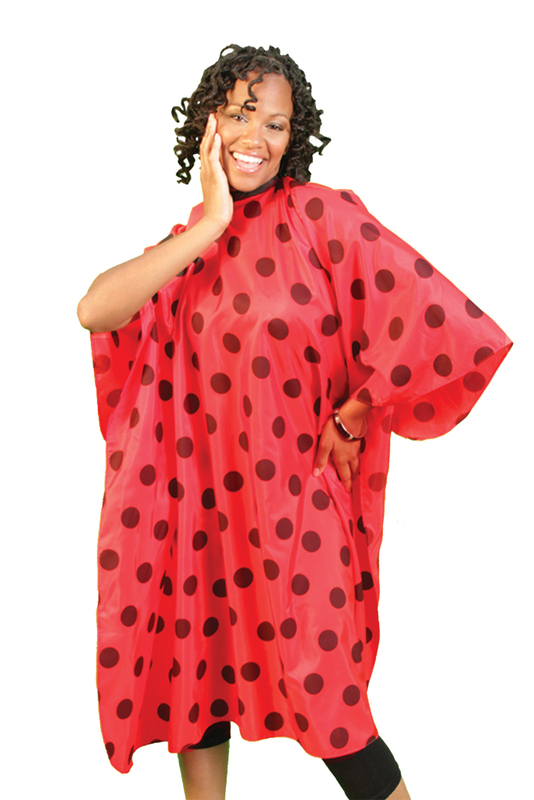 When it comes to our capes, we have a few polka dotted garments to choose from. They are even among our most affordable styles, so you can have a little fun in the salon for less! Unexpected colors and patterns are nice, and your clients are sure to appreciate capes that are anything but boring and plain, but they still only do one job—protect their clothing. What if your capes could do more? You’re probably wondering how a cover can keep your clients entertained in the chair. It’s really as simple as adding a clear plastic window to the front of the cape. With a media window, your client can browse the internet and return text messages without having to remove their hands from underneath the cape! This guarantees that their clothing and expensive electronic devices won’t get damaged or covered with hair, but it also makes cutting their hair easier because they aren’t squirming around, trying to read their latest text message. 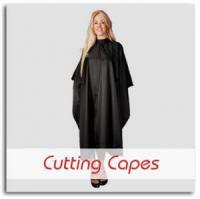 Looking for a step up from basic salon capes? We offer a line of client gowns as well. These styles will make your client feel a bit more like they’re in the spa than the salon. They’re an especially good idea if your client will be having their nails done, or if they’ll be spending a lot of time in the chair. Clients who are having their hair done for a special occasion will also appreciate feeling like a special guest in your salon by wearing such a classy client gown. 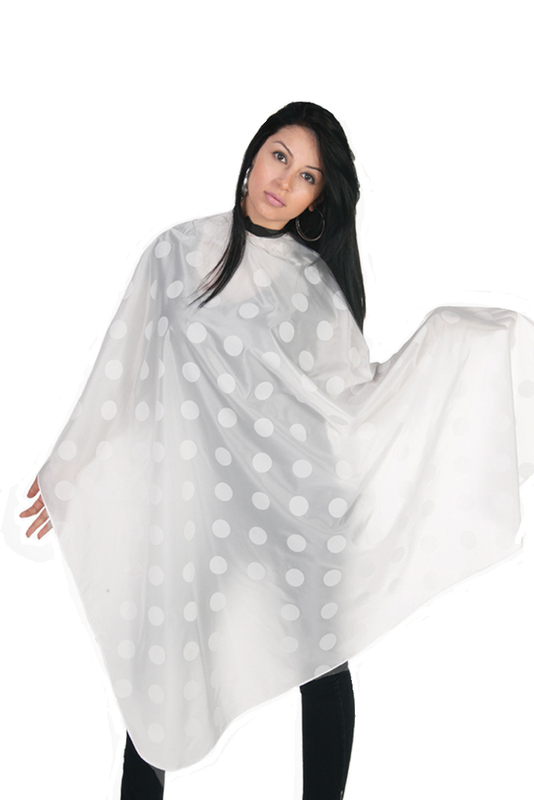 Whether you choose a cape or a gown, all of our garments are made out of high-quality materials. They are bleach-resistant, so you never have to worry about them getting stained, even if you’re using harsh chemicals. They are also water-repellant, allowing you to wipe away most messes. If they do need a quick wash, simply throw them in the washing machine and tumble dry on low. Not only do we offer client gowns and capes, we also offer a range of fun stylists accessories! No matter what your budget or style preferences, we have the perfect garment for both you and your clients. Shop around on our website for the perfect addition to your salon, and don’t hesitate to contact us. We’d be happy to answer your questions!